Happy Birthday Shakespeare! You’ve killed us all! 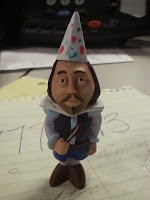 So, what are you doing for Shakespeare’s Birthday (aka Shakespeare Day) this year, April 23, 2018? My birthday missed Shakespeare’s by just five days, so I might as well die the same day he died. Then again I’ll have to share that honor with 8 billion other people.Well, what can ya do?